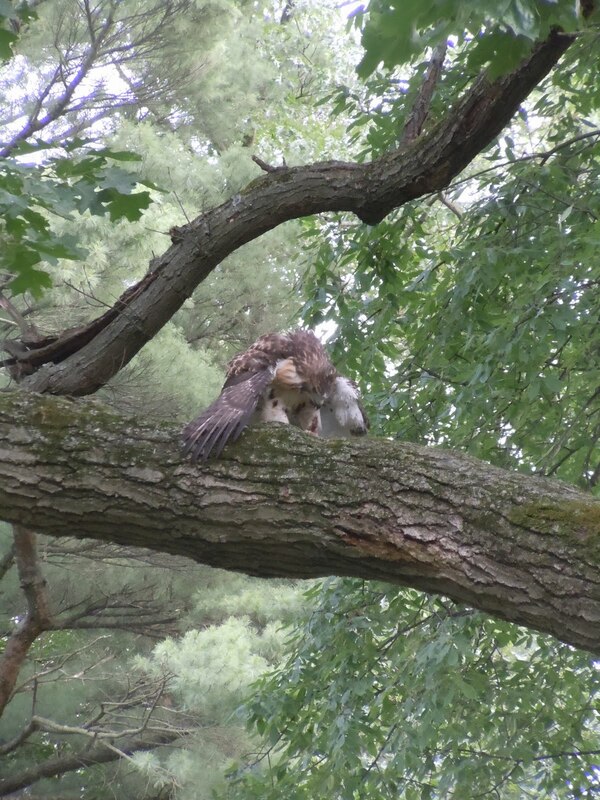 This red-tailed hawk (Buteo jamaicensis)'s fledglings just left their nest in the Arb. If you look closely you can see this parent carefully showing its children (sitting above it in the tree) how to eat a chipmunk after catching it. The message here is clear: parents, if you want your children to be able to catch and eat rodents on their own, you will have to show them how. Where in the Arb isvthat? The nest is in a white pine on the edge of the Main Valley (Main on the map). Right around the 0.15 mile marker (http://www.lsa.umich.edu/mbg/files/ArbGuide.pdf). The shot was taken in a large black oak that is on the hill in between the Main and Hawthorn Valleys.